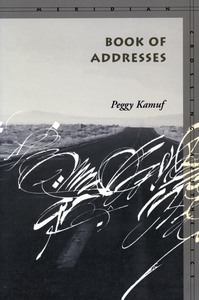 Peggy Kamuf's Book of Addresses is a book that enters in dialogue with the corpus and esprit of Derridean deconstruction, a book that shuns no Socratic or Derridean irony, to the point where, in its very opening pages, it is willing to question the “ontological status” of its own accomplishments as a book. Reflecting on the ambiguity of voice in the English word “address,” Kamuf avows that the act of addressing simultaneously invokes the active and the passive voice-signaled in the phrase “essays are (being) addressed”-meaning that every mode of theoretical address necessarily puts into play the relation to the other. Aware of the burden thus placed on the originator of the address, Kamuf's brilliantly argued and lucidly written book addresses the ethical and theoretical implications of Derridean deconstruction. As she acknowledges, the “move to comprehend some piece of writing by Derrida, appropriates it in a way,” an act of appropriation intrinsic to the act of addressing, insofar as “advocare” means “calling up the voice or speech of another.” Enacting the ethical imperative of deconstruction as loving dialogue and critique, Kamuf, as a scholar of literature, especially engages the field of literary theory, one of the few fields, she reminds us, that “takes fiction seriously.” Acknowledging that deconstruction always proceeds by means of a double gesture, that of reinscription and erasure, Kamuf compellingly rejects the reductive misconception that deconstruction is merely deconstructive in nature; instead, deconstruction's commitment to affirmation and love allows it to engage in a loving relation to the text without endangering its commitment to the Kantian labor of critique. Moving through and also beyond dialogue with Derrida, Kamuf's Book of Addresses is written in a polylogic form that allows for continual self-interruption, reiteration, and interrogation, creating a space for multiple responses and even making room for an afterword written by Branka Arsic, “On Leaving No Address.” Rather than developing a singular argument, Kamuf pluralizes the possibilities of argumentation and interpretation by addressing a series of questions that remain open to many readers: How is it possible to love a text? How can feminism affirm the inappropriability of its subject? How can we take fiction seriously? How can deconstruction be experienced? How to read “deconstruction reading politics”? What are the rights of response and non-response in democracy? How to redefine the haunts of scholarship, and its future responsibilities? Kamuf's Book of Addresses is an address book whose owner knows all those listed in her book have moved. Kamuf's call at each address is an attempt to construe these changes of habitation and the transformed habits of theory's itinerant inhabitants. Often “in the company of [their] thought,” Kamuf negotiates the byways of her subjects' displacements and their theory's translocations. Those called on by/through Kamuf Book of Addresses span the last five decades of theoretical reflection in the twentieth century. They range from household names such as René Wellek to those who left no address and no name, but whose traces continue to alter the theoretical landscape, nonetheless. An interlocutor as much as a de-coder of our theoretical legacy, Kamuf's book demonstrates that she is as consummate an interpreter of theory's intricacies as she has been a translator of some of theory's most Delphic voices. She communes with theory's haunting specters as much as with its palpable embodiments, gendered and trans-generic. Kamuf's Book of Addresses undresses the squeamish and books theory's congenital transgressors. In the final analysis, the committee was above all impressed by Kamuf's elucidating and incisive dialogue with Derridean deconstruction, her ability to put deconstructie theory in the context of other significant theoretical thinkers (such as Wellek and Warren, Freud, Heidegger, Raymond Williams, and Cixous, to name but a few) and, above all, to reinvigorate the debate about what deconstruction can mean for literary theory.